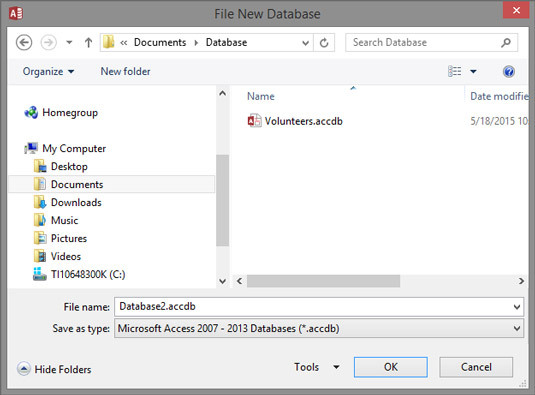 So you want to dive in and start building a database in Access 2016? Keep in mind that it’s a good idea to take it slowly. 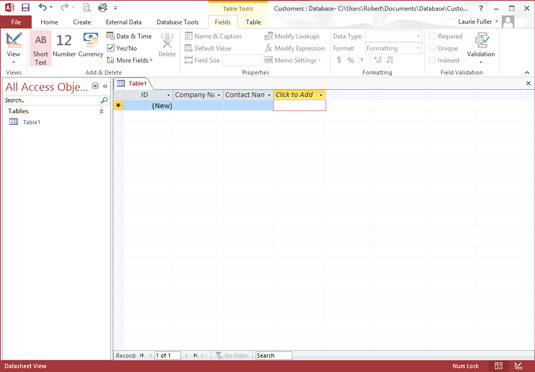 In the following procedure, you set up a new database and then use the Table Wizard to build the first table in the database. If Access is not already running, take a moment to start it. In the Access workspace, a series of large template icons appears, below a Search for Online Templates box, accompanied by links to likely searches for templates that store Assets, Business, Contacts, Employee, and so on. Click the Blank Desktop Database icon. 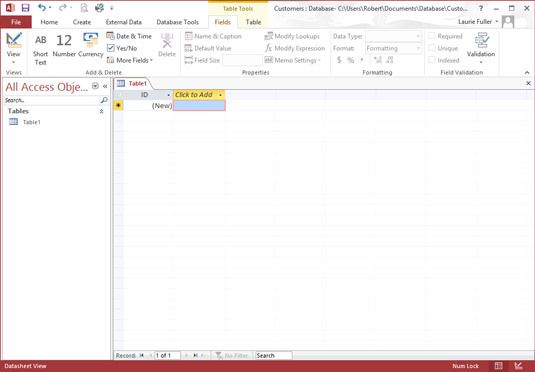 A Blank Desktop Database dialog box appears. New blank databases need names. Give yours one here. Type a name to replace the generic DatabaseX (where X is the number assigned chronologically to the database). You don’t need to type a file extension (.accdb); Windows 7 and 8/8.1 display your extensions automatically. Also, if you accidentally delete the file extension while changing the filename, don’t worry — Access adds it to the filename you type. If you don’t like the folder that Access picked out for you, click the little folder icon and choose where to store the new database. Select a home for your new database. When you click that little folder icon, the File New Database dialog box opens. From here, you can navigate to anywhere on your local system or on a network to which you’re connected and select the drive and folder on which to store your new database. When you’ve finished selecting a spot for your new database, click OK to return to the workspace. A blank table, called Table1, appears in the central section of the workspace, and on the left, a panel lists the parts of your database (there’s just one part so far). When you click Create, if a dialog box pops up and asks whether you want to replace an existing file, Access is saying that a database with the name you entered is already on the disk. If this is news to you, click No and then come up with a different name for your new database. If you intended to replace that old database with a new one, click Yes and proceed. Create and name your fields in the table by double-clicking where it says Click to Add at the top of the second column in the table. Click the arrow to the right of the words Click to Add and choose the type of field you want to add. For most fields, Text will be the type, but your data and its nature (and your desired uses for it) will dictate what’s best to choose here. What’s that ID field in the first column? It’s there by default and will contain a unique number for each record you create (when you start entering records, later). This provides the unique field that each table requires, especially if you’re going to relate your tables. You can change its name by double-clicking the name “ID” and changing it to, for example, Customer Number. Later on, after you’ve set up your tables and established relationships between them, you can reassign what’s known as the primary key (another name for a unique field in a table), and at that point, if you want, the ID field can be removed. Type a new field name (to replace the highlighted placeholder name), and press Enter to save the new field name. As soon as you press Enter, a new field appears, with a blank at the top, awaiting a name. Repeat Steps 7 and 8 until you have all the fields you think you’ll need in this table. You can always rename them later (by double-clicking the current names), so don’t worry about perfection at this point. Just start setting up fields so you can start entering data. Create new fields by pressing Enter after naming each one. To save your new table and the entire database, press Ctrl+S or click the Save button on the Quick Access Toolbar. It’s a good idea to save each time you’ve done something important — building a table, updating some fields, adding records, and so on — essentially after anything you’d hate to have to do over again. Choose Save from the pop-up menu that appears. Type a name for the table in the resulting Save As dialog box. Click OK to keep the name. Resave your database to include this change.